A son of slaves, George won several awards for his contributions, including the Spingarn Medal of the National Association for the Advancement of Colored People (NAACP). He spent most of his career teaching and conducting research at the Tuskegee Normal and Industrial Institute (now Tuskegee University) in Tuskegee, Alabama. Born into slavery in Diamond, Missouri, George Washington Carver’s parents were Mary and Giles. His birth year is somewhere was probably 1860 or 1864. Their master was Moses Carver, a German American immigrant. At a week old, George was kidnapped. Moses Carver paid for him to be returned to his parents. Moses Carver was a kind-hearted man who, after the abolition of slavery in America, raised George as his own child and furthered his intellectual pursuits. George attended various schools before receiving his diploma at Minneapolis High School at Kansas. Later, George moved from school to school seeking knowledge, struggling against discrimination. Rejected by universities, he began homesteading. He learned art and piano at Simpson College in Indianola, Iowa in 1890, where his art teacher recommended George to study botany at Iowa State Agricultural College. George got a loan, and in 1891, he became Iowa State Agricultural College’s first black student. He obtained a master’s degree in Botany, conducting field research at the Iowa Experiment Station. 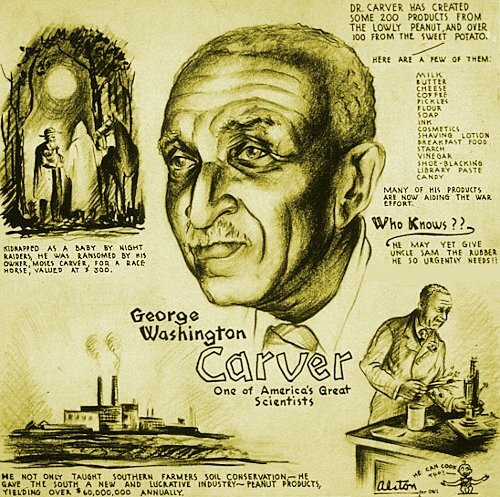 George Carver began teaching as Iowa State Agricultural College’s first black faculty member. His successful work in plant pathology and mycology gained him countrywide acclaim and fame as a prominent botanist. In 1896, Carver moved to Alabama as head of the Agriculture Department at the Tuskegee Institute (now Tuskegee University), a historically black college, where he worked until his death 47 years later. 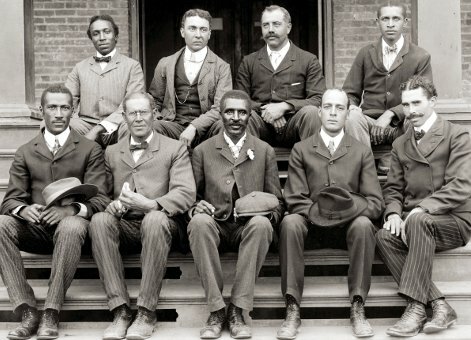 Tuskegee Institute faculty photo in 1902. Carver is in the middle of the front row. Carver was a farmer’s scientist. He taught farmers how to grow better plants, utilizing farm waste products. He turned corn stalks into building materials. Carver found dyes in the rich clay soil. He manufactured more than 100 products from sweet potatoes. A lack of crop rotation was a problem in America’s southern states. Repeated plantings of cotton were depleting the soil of it nutrients. Carver promoted nitrogen-providing peanuts as an alternative crop to cotton to prevent soil depletion. He advocated farmers rotate their crops between cotton and the highly nutritious food crops of peanuts and sweet potatoes. Carver featured in this issue from the News Bureau of the Office for Emergency Management during World War 2. Carver was a devout Christian. He believed faith in Jesus Christ could help heal divisions in society. On Sundays he led a Bible class at Tuskegee University. 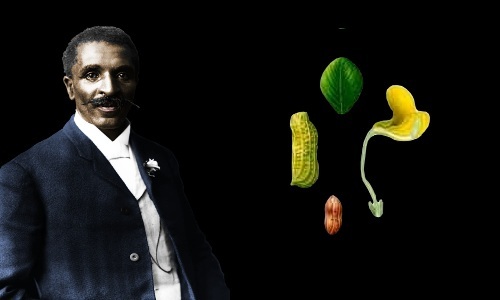 George Washington Carver died after falling down a flight of stairs on January 5, 1943 in Tuskegee, Alabama. He was about 80 years old. He had never married and donated all his assets to the Carver Museum and to the George Washington Carver Foundation. He was buried in the Tuskegee University Campus Cemetery.